Big Bud is a well-known, much loved cannabis strain which won the Cannabis Cup in the Indica category in 1989. Big Bud was originally a strain from the United States, and it was imported to the Netherlands in the early ‘80s in an effort to save strains developed in the US from the War on Drugs. It has since been developed into a more potent, tastier version of itself, while retaining the trademark insane bud production and lovely high. Big Bud is one of the marijuana strains every one has to try at least once in their lives. Big Bud is an Indica-dominant marijuana strain, with 85% Indica genetics and 15% Sativa. It looks mostly like an Indica – it doesn’t grow very tall, and it has wider and more rounded leaves than Sativa plants. The most eye-catching quality of the plant is, of course, observed after flowering, when pretty much everything you can see from the plant are huge, heavy clusters of buds. The buds themselves are light green with thin orange hairs and a fair amount of frost on them. Big Bud cannabis strain isn’t a particularly smelly plant – some earthy notes might be observed. The taste, however, is sweet and spicy, with undertones of grape. As for effect, Big Bud produces a strong stoned body sensation, with a tendency toward couch-lock. It is a very sedating marijuana strain, one of the best cannabis plants for people who need help with insomnia. It’s also good for migraine, nausea and stress because of its calming effects. This makes Big Bud a bad strain to use during daytime, and a poor choice for social situations. Growing Big Bud isn’t recommended for inexperienced growers. There are several issues that come with Big Bud, the most important of which would be the fact that it isn’t a particularly forgiving plant and it doesn’t bounce back after mistreatment that easily. Big Bud isn’t very resistant to pests and mold, and it’s reported to be a hard plant to clone. 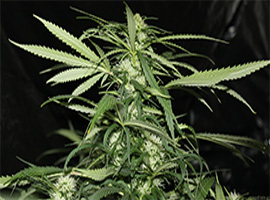 Sometimes, the Sativa genes kick in during flowering and the plant starts “stretching” – growing rapidly. This can be dealt with early on, either by flowering Big Bud early, or by topping the plant. Another common issue with Bid Bud is the heavy yield – it might bend, or even break branches, so it would be a good idea to provide additional support to the branches which look the most promising. You can buy Big Bud seeds online from a number of different seed banks and grow shops. Sensi Seed is the company responsible for most of the advancements in the strain since its introduction to the Netherlands, so many people choose to buy their seeds for that reason. Of course, if you want to buy cheaper Big Bud seeds, you can try look for seeds from a different company.